There is a parable floating around the animal rights movement. It goes something like this. Horses used to be the main form of transportation in the United States. Of course, horses don’t want to be ridden—they’re “broken” to be domestic, and then taught to be ridden and obey humans. Being subjected to hard labor causes horses a lot of suffering, physical and mental. In New York City alone, there were probably a hundred thousand horses being exploited for transportation. If you lived back then, you probably would’ve wanted this to end. It probably wouldn’t have. But then along came the car. Once the car was invented, it was quickly recognized as a superior form of transportation. Within a few years (or decades), the use of horses for transportation was almost completely phased out in favor of cars. As we can see, technological progress can do more to reduce suffering than advocating from an ethical standpoint. Thus, we should all focus on technological progress (such as the development of cell-based meat) as the answer to animal liberation. This is an interesting takeaway, and certainly one that is worth considering. Technology is incredibly powerful, and it often shapes the course of history. As the book Guns, Germs, and Steel demonstrates, those with the most advanced technology often go on to influence or control the rest of the world. In fact, I believe the movement for animals could benefit from a much greater appreciation of the power of technology. We should be encouraging people to learn programming, to learn how to create machine learning algorithms, to learn about drones, to learn about the “internet of things”, to try developing cell-based meat, and above all to understand how science and technology are tools that we must use in one form or another. We should be taking advantage of technology much, much more. But there’s another thought that I have, which is that since we have another hundred years of history under our belt, we should analyze the full implications of this parable. With the car came the ability to much more easily transport large quantities of goods a long distance. In this simple fact you can see the beginning of our modern day shipping and transport infrastructure that moves an unfathomable amount of material from one place to another every single day. There are good parts of this, and bad, and horrific. For example, our shipping infrastructure also moves hundreds of millions—billions—of animals from farm to slaughterhouse, and then it moves their dismembered bodies from slaughterhouse to grocery stores. With the invention of the car came the invention of the factory assembly line, and with the assembly line came many other industrial machines and processes that directly and indirectly gave rise to factory farming. “Get big, or get out”—words spoken by Earl Butts, who saw the potential for industrializing our agriculture. And, ignoring for a minute all ethics and environmental consequences, he was on to something. Industrialized animal agriculture (and non-animal agriculture) gave us mountains of food for cheap. With the power of industrialization, we get more things, faster, for cheaper. Pretty cool, eh? The car not only signaled the end of the use of horses, but it also indirectly signaled the beginning of the rise of factory farming—a system of cruelty so vast that the net negative impact on sentient beings is almost assuredly much, much worse then the total negative impacts caused previously by humans using horses instead of cars. So we can start to see that there are really two lessons in this parable instead of one. The first lesson is that technology is powerful and shapes the course of history. I completely agree. But the second lesson is perhaps more subtle, and requires more historical context—and it’s potentially more important. The second lesson is that technological progress is neutral. It can be used for good, and it can be used for bad. Unless there is an inherent reason why the technology should not be used for bad, it will probably be used that way if there is any incentive to do so. Technology can be used to replace horses with cars. Technology can also be used to construct factory farms and inflict endless torment on trillions of sentient individuals. So what keeps us from using technology for evil, and only for good? The answer is our collective human ethics—the things we are, and aren’t, willing to do as humans. We aren’t willing to conduct painful or destructive experiments on humans without their consent—and often even with their consent—even if doing so might lead to some great breakthrough in medical knowledge that could save lives and prevent suffering. No matter the gains, we simply aren’t willing as a society to cross that line. Anytime we discover a new thing that we aren’t willing to do (or allow) in human society, we construct a new law to codify it. When we think the whole world should abide by that law, we try to get unified global agreement on the issue, often through an international institution like the United Nations. Our ethics become our laws—and vice versa, in many cases. Thus, when taking the long view—the view that looks hundreds or thousands of years into the future—we must discuss ethical progress. Technological progress is neutral. It must be constrained by ethical progress. If we want to broaden our societal ethics to include nonhumans as well as humans, we need to expand humanity’s moral circle. Unless we manage to inspire a greater ethic within humanity, any technology which is used for good today might just as well be used for evil in the future. And, as we’ve seen with factory farming, the numbers of individuals who are impacted in the future might be mind-boggling to us today, just as the number of factory farmed animals today would probably be shocking to people living at the turn of the 20th century. The point is that as we’re all hoping for technology to help us in this movement for animals—something which I’m personally very hopeful about as well—don’t forget that technology is not enough. We must also expand the ethics of humanity to use technology for good. The lives of boundless future individuals depends on it. Animal Movement Project (AMP) is a platform dedicated to building the movement for animals. It’s important to talk about negative emotions. We all feel them at one point or another: sadness, anger, disappointment, frustration, loneliness. Sometimes they’re small feelings that we can easily manage. Sometimes they’re bigger feelings that hang around for days, or weeks, and you have no idea how to make them go away. “Isolation” often involves negative feelings, and it’s important to talk about those. Sometimes, though, isolation isn’t necessarily a negative feeling—but it can have negative results nonetheless. I’ve felt or fallen into each of these types of isolation in the past, some of them fairly frequently. I’m sure many of you have, too. So let’s talk about it. First, there’s the type of isolation where you just feel alone. You want a friend, a comrade, someone to talk to—frankly, anyone. Doesn’t matter too much. This can happen if you move to a new city, or get a new job, or fall out of your old friend group. Honestly, maybe you’ve never had that close of a friend group to begin with, or you haven’t had one for a while. You’re just lonely, and want connection. Second, there’s the type of isolation where you want another activist to talk to. You feel like the only one in the world who cares about this enormous problem, and you just want to talk to someone who says, “Yeah, animal exploitation is horrific, we absolutely need to end it.” You want someone on your side. You need someone who understands the emotions you struggle with regularly. Third, there’s the type of intellectual isolation where you’re only surrounded by people who think the same way as you do. This could look like being a part of a tight-knit, homogeneous activist group where you all think about animal activism in the same kind of ways. It could look like working for a specific animal advocacy organization and not interacting much with other groups. Maybe you see someone advocating for animals in a totally different way and think, “How could they possibly even think that’s effective?” Maybe you work on corporate campaigns and can’t possibly see how disruptions would ever be effective. Maybe you go to slaughterhouse vigils and don’t see how creating new plant-based products is actually moving the needle. Fourth, there’s a kind of moral perspective isolation where you think that no one could possibly be an ethical human while they’re participating in animal exploitation. “I don’t care if they’re trying to eradicate global poverty, and they recycle, and they volunteer for their local PTA, and they’re mostly vegetarian. If they eat chicken twice a week, they’re a horrible, evil human being with no moral values.” You think that the ethical point you’ve reached is now the baseline for everyone else to be at right at this moment, and you view people as either “ethical” if they meet your requirements or “unethical” if they don’t. It’s hard for you to support the good that other people are trying to do in the world if they aren’t vegan. Fifth, there’s the isolation of only knowing other activists and vegans online, and not in-person. As much as the internet connects us, and as awesome as digital technology is, there are many things that can only be had—or are much easier to have—through in-person interactions. Sure, you could get on Google Hangouts and drink a beer with your friend, or have a phone call and “grab a coffee” with someone who you don’t know as well, but it’s not going to be exactly the same. One specific example of this type of isolation is working remotely for an animal advocacy group, like I do. There are a ton of in-person dynamics that don’t really happen between me and my colleagues, because we interact exclusively digitally. This is really hard and can lead to feelings of isolation. Sixth and last, there’s the isolation that comes from being in a close relationship (romantic or not) with someone who isn’t on the same page as you about animal exploitation. This can feel even worse than simply being alone, sometimes, because you feel like you should be connected with this person on deep issues, but yet there’s this major discrepancy—one of the most important issues to you. I get it—it’s not fun to talk about negative subjects when there isn’t some kind of solution presented. First, feel free to acknowledge any of these feelings or types of isolation if they apply to you. It’s ok to acknowledge the feelings without having a clear solution right there. But since you mentioned it, let’s go ahead and talk about some ideas for solutions. Set yourself a goal to try to connect with someone in person in the next few days. An easy way to do this is by asking people questions. You can ask the barista at the local coffee shop what they do in their free time. You can ask the person sitting at the table what they’re reading or working on. You can also find events specifically geared toward meeting new people. A great place to do this is on Meetup.com. Just create an account, search for some groups that sound interesting to you, and go to the next event. Once again, asking people questions about themselves is a really great way to start getting connected to someone. “Hey, my name is Steven. What’s your name? Are you in school, or do you work full-time? What’s one of your favorite things to do around here?” You can also try to connect with other activists specifically. This one might be a little harder than Type 1, just because there are fewer animal activists in the world than there are non-activists. If you can find local activists who live in your city, or even a neighboring city, reach out and see if you can grab coffee. Like I mentioned above, asking the other person questions is a great way to start building the relationship and keep the conversation flowing. You can try to find local activists through Meetup or Facebook Groups. If you can’t find anyone local, then connect with someone digitally. Reach out, and see if you can schedule a phone call or video chat just to get to know each other and see what they’re working on—something more personal and human-feeling than just typing back and forth. If you find yourself thinking that your way is the only way to advocate for animals, or if you can’t possibly see how the work of others is effective, then you might be intellectually isolated. Try to mingle with different types of activists who are working on the issue from different fronts: people working on corporate campaigns; people doing protests; animal sanctuary staff and volunteers; folks who make vegan products; media and content creators; etc. There is a lot of work being done out there, and you’ll be able to do your best work if you can talk with people approaching activism in different ways. Also, read widely and learn from all areas of activism and life. If you’re someone who “hates history”, go watch a YouTube video on history. If you never read anything about psychology, go pick up a book on it. Staying curious about all subject areas is a good way to keep yourself from getting stuck in an echo chamber. It can be easy to think that if someone is contributing to animal exploitation, they’re simply not an ethical person. But this kind of black and white thinking isn’t only incorrect, it can also make you feel bitter and angry towards other people and keep you from connecting with them. Most people view themselves as ethical, and they usually have reasons why they think that. “I’m nice to others,” or “I help out my family and friends,” or “I volunteer at the local food bank,” or “I donate to charities.” And these are, in fact, good things that we want to exist in the society we’re helping to create. We just also know of another facet of ethics that hasn’t made it into these people’s identities yet. It’s our job to show them how the ethics that they already practice also extend to nonhumans—we’re simply helping them extend their ethical identity which already has a foundation built on other things. This one is hard, and it’s probably where a lot of vegans find themselves. First, consider asking activists who you know online if they want to have a phone or video call with you sometime. Typing or texting back and forth is fine, but it lacks a lot of the human elements we crave: tone of voice, laughing along with someone else, the back-and-forth banter of conversation, the facial expressions. Bring the human elements into the digital realm as much as you can. Second, consider traveling to see other activists at least once a year, more if you can. The Animal Rights National Conference is a great place to see people, as is the Animal Liberation Conference. You could also just travel to visit a specific person you know, or you could go to a big activist hub like Los Angeles or London to meet up with folks there. Third, make sure you’re finding value in spending time with the non-activists who live near you. There’s always something to learn, and there’s always a connection to be made with someone different from you, even if that connection isn’t related to helping animals. Who knows—maybe if you invest some time in local relationships, those people will become your vegan activist friends one day. This one is really tough, and can be very emotionally taxing. First, think about the things you do have in common. Make sure to emphasize those when you’re with this person, so that they feel connected to you. This will not only make your interactions positive, but it will also put them in a better emotional space to hear your thoughts about animals. Read up on nonviolent communication and emotionally focused therapy to better understand how your language and emotional connection with the other person are incredibly important. Second, understand what you need your boundaries to be. Some people choose to take the liberation pledge and not sit at tables where animals are being eaten. Some people set strong boundaries that they’re only going to live in a vegan house or apartment where no animal products are eaten. Be honest with yourself about what you need, and communicate that clearly and empathetically to the other person. Third, if the other person is antagonistic about your beliefs, or if you feel like you aren’t being supported in wanting to help animals, you always have the option to leave the relationship. This obviously isn’t the easiest solution or the most ideal, but sometimes it might be the best choice. This is especially the case if there are any unhealthy or toxic patterns in the relationship related to your desire to help animals (or for other reasons too, of course). Finding someone who cares about you and who is willing to talk about any of these issues is always a great step to take, if you can. This person could be a friend, a family member, a therapist, or another activist in your area. Also, make sure you’re taking care of yourself. We sometimes like to think of our minds and our bodies as separate, but they’re all part of the same system. Make sure to get enough sleep, eat healthy food, exercise daily, and have some kind of practice like meditation or self-reflection. Finally, here are some resources that can help you out further if you need. First of all, the title “Space Analysis” sounds really epic, doesn’t it? Like we’re going to be cosmologists or meta-astronauts analyzing outer space. We’re not going to be doing that. But, what we will be doing is equally cool—and definitely more useful for you. Conducting a space analysis is a way of taking a huge potential set of activities and options and looking at them in an organized way that you can understand and communicate. It’s about finding the gaps in your thinking, and seeing the relationships between pieces. It’s going from a heap of books to a library. It’s going from a random jumble of websites to Google. It’s turning the massive physical world into a small paper map. It’s going from infinite uncertain options to understandable finite choices. If you’ve ever felt uncertain, or like you’re missing something, or like you don’t know how to tie a bunch of different things together into one unifying story, then a space analysis can help you. “Ok, ok,” you might say, “but what’s the definition of ‘space’?” I’m glad you asked. I come from a math background, so that’s how I usually think about things—and that’s where this concept of “space” comes from as well. Basically, a space is a way of thinking about a range of possibilities—the whole spectrum of possible solutions, the complete picture. We want all the relevant points, and we want them right here. That’s our space. The “relationships between points” mentioned in the second definition is something we’ll come back to later, but essentially it’s helpful to think about where things exist in a space, in relation to each other. But enough with definitions. Let’s get some practical examples going. When we talk about “space analysis” or analyzing a “space” of options, I want you to think about a map. A map shows where things are in relation to each other, and this is what a space does. It can also show holes in your knowledge—blank spaces on the map where you don’t know what’s there. Furthermore, perhaps you’ve drawn the boundaries of the map where you currently think they are, but maybe there’s actually more to be discovered outside those boundaries. Maybe some of your locations and shapes and names for things are wrong. Maybe you totally don’t know that Australia exists and so you just put ocean and sea monsters in that part of the map. This is what we’re doing with space analysis. Let’s get some specific examples in here related to animal advocacy so that you have a better idea of what this is all about. 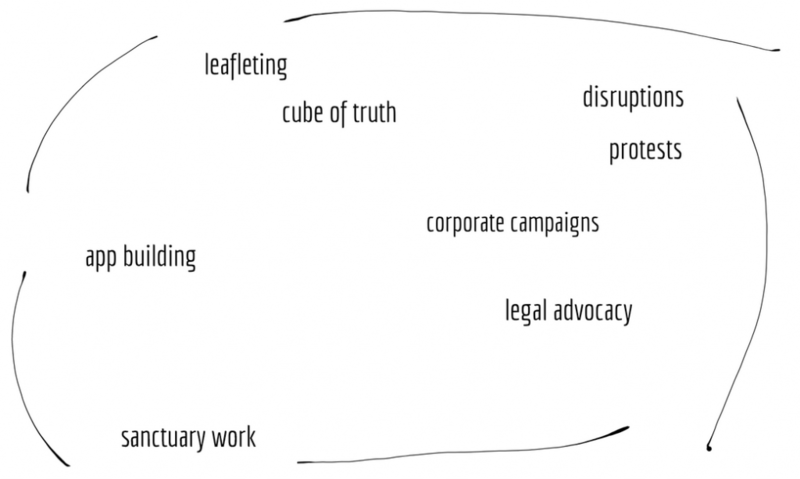 One space we could look at is the space of tactics an organization might use: from leafleting, to protests and disruptions, to corporate campaigns, to individual animal care, to app building, to legal advocacy. Did I leave anything out of that list? Of course I did—I can immediately think of open rescue as something I missed, as well as writing pieces for the media. I also missed social media activism, creating plant-based products, and a whole host of other things. Asking the question “What did we miss?” is a big part of conducting a space analysis. You’ll notice that this space currently isn’t organized in any meaningful fashion. We’ll talk about that more later. The space of projects you could work on in the next 6 months. The space of products that involve animal exploitation. The space of organizational structures. The space of kinds of technology. The space of habits you could develop. The space of subject matter you could study. The space of places you could look to hire new staff or find new activists. Whenever you’re faced with a big brainstorming session, or some question about vision or strategy or choosing among different options, ask the question: Can I map this out? Is this a space I can analyze? Most of the time, it is. In our maps above, we have a bit of a problem…we didn’t define what distance means. Why did I put “plant-based products” close to “app building”? Why is “open rescue” closer to “sanctuary work” than it is to “disruptions”? For example, on a map of physical places, we define distance in terms of units of physical distance such as miles or kilometers. If we have a map of the internet, distance might be in terms of page links or topics. Distances can be precise, or they can just be guesses about the relationships between items. One easy way to begin mapping out a space is by building “quadrants” composed of two axes, where each axis is a quality or descriptor. If something is far along one axis, it means the thing is very like that quality that the axis represents. 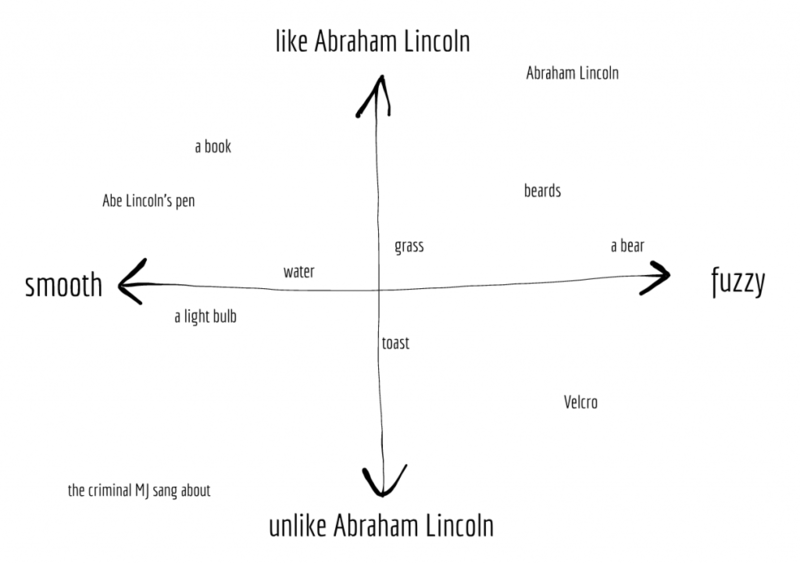 Unsurprisingly, Abe Lincoln himself gets a 10/10 on the “like Abraham Lincoln” axis. Let’s construct a graph that we actually care about. Data on farmed animals from here. Population data from various sources. Animal data includes fish. Even with a very rough graph (not very precise, no tick marks on our axes, no labels, etc. ), one of the most important results jumps out at us: China has way more farmed animals than other countries. This is one of the powers of visualization—you can easily see the important points and filter out the noise. The human brain just works better with visuals. If we could easily graph things in three dimensions (or four, or five…), we could use more axes and get a better understanding of a space at a glance. But alas, we can’t—so for now we’ll stick to two-dimensional quadrants. We can, however, use multiple quadrants to analyze the same space in greater detail. 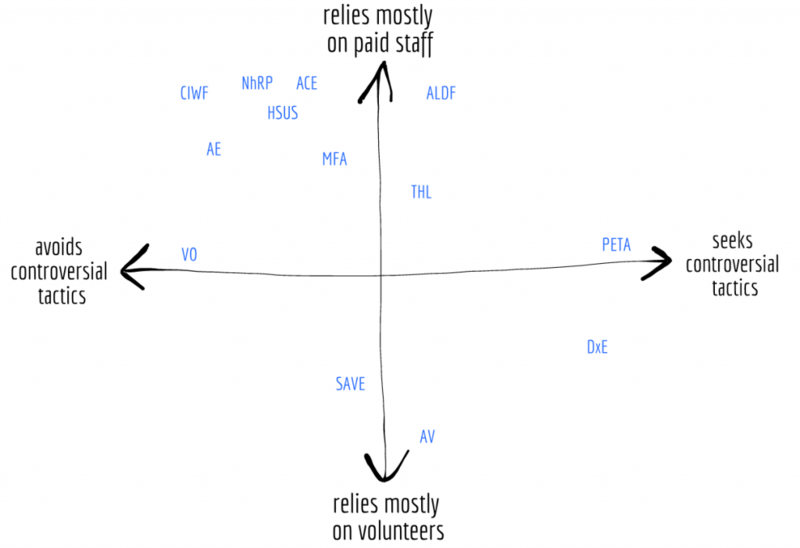 Let’s analyze animal rights organizations in two separate quadrants. 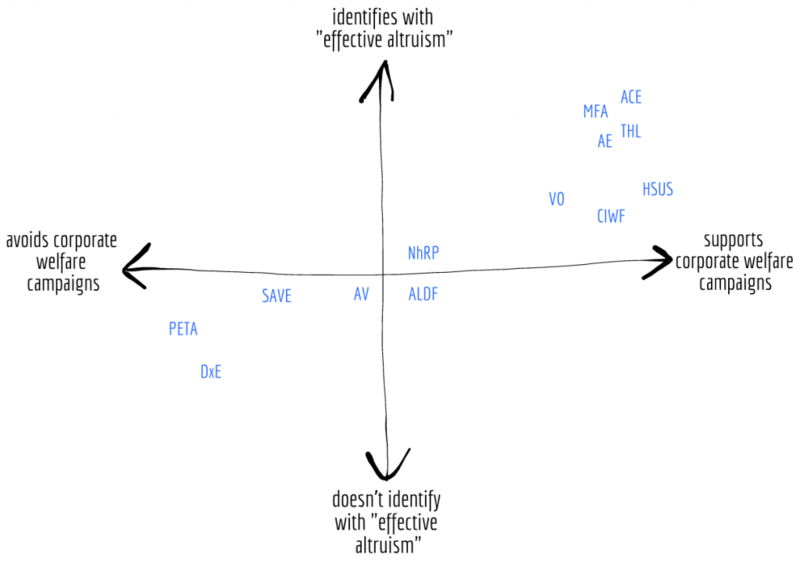 A plot of various animal rights groups by acronym. This is my initial guess at placement to demonstrate the purpose of the technique and isn’t meant to be my definite thoughts about how these organizations relate to each other. For a list of acronym meanings, see Appendix 3. Same caption as the above quadrant. And those are quadrants. Tada! Keep them in your mental toolkit. If you want an easy way to create quadrants in Google Sheets, see the example I created: Space Analysis – Graphing Quadrants in Google Sheets. Another simple way to look at a space of things is to simply categorize them into some logical buckets. Steven’s Categorization Of: What’s Important in Life? I first start by asking one of the biggest questions that exists: What are the important things in life? By starting there, I can begin to break things down further into more actionable subcategories, such as “physical health”, and even more specifically “exercise”. Once I’m satisfied with the specificity of my subcategories, I can decide how to take action on them. In this specific case, I could list out specific routines or habits that would tie in all of the important pieces: a morning routine that involves exercise, a healthy breakfast, and journaling, for example. Let’s talk about “mutually exclusive and collectively exhaustive” ways to divide up a space. MECE basically means “make sure you’re aware of all the pieces, and that the pieces are all unique.” No overlaps, and you’ve covered 100% of whatever you’re analyzing. As a more concrete example, let’s go back to our example of a map of the world. On a map, one possible MECE division would be to draw lines between countries (and also lines dividing countries from bodies of water). Any point on the map will only be a part of one country or body of water, and the whole globe will be sectioned off into countries and water. It’s both mutually exclusive (things can’t be in more than one group) and collectively exhaustive (the whole map has been categorized). When we’re coming up with a MECE division, we want to ask: “Is the full range of possibilities listed here? And are my boundaries between options clear cut?” Dividing up your space into MECE divisions gives you an easy way to talk about different areas of your map. As another very straightforward example of a MECE division of a space, let’s suppose the space we’re looking at is all real numbers—which, simply put, is just a number line. A MECE division of this space is to create three groups: the negative numbers, the positive numbers, and zero. All numbers are included, and no value is part of more than one set. negative numbers, positive numbers, and zero. Maybe you’re looking at the space of strategies you could employ for the next three years. You might try to define the potential impact areas, as ACE has done with their menu of outcomes that we mentioned above. This menu of outcomes represents the full space of outcomes that ACE thinks we might be trying to achieve with our work, where the different outcomes are pretty distinct. In other words, all the possibilities are listed and the boundaries are clear. That’s MECE. This isn’t the only way to look at a space of course. It’s perfectly possible (and sometimes desirable) to have items that overlap in various categories and have more complicated connections and relationships between them. For example, we might take more of a systems thinking approach where we consider pieces both by themselves and also as part of larger entities (“systems”). But that’s a very big topic for another day. Are you ready to dive in and try this for your own project or problem? Here are some ways to think about conducting your own space analysis. First, what is the space you want to look at? This might actually not be easy to answer. (“Uhhhh…the whole animal rights movement?”) Something that’s too big or not clearly defined at first might begin to take more shape as you start asking more specific questions about your space and the pieces of it. Try to think about the specific domain that your problem or project fits into. Are you looking at tactics? What kind of tactics? Or are you looking at people, or ideas? Try to clearly define your space so that you have an easier time analyzing it. Second, what’s the goal you’re trying to accomplish? Do you want to have a clear decision that comes out of this space analysis, or a choice? Or are you simply trying to categorize things to understand them better? There are many different goals you could have with this process, so knowing what you’re trying to accomplish is important. You can ask yourself: Am I looking to make a decision or am I simply looking to learn? Third, what approaches are you going to use to analyze your space? Maybe you’ll start with a simple categorization, and then construct some quadrants as a means of better understanding your space. Or maybe you need to start by just writing everything down on post-it notes and moving them around to see what kinds of patterns emerge. It’s usually best to start by getting something down on paper and then getting more specific and precise from there. Action leads to understanding—if you’re having a hard time knowing where to start, just pick something to do and figure it out as you go along. Fourth, after you’ve discovered something or made a decision, how are you going to document what you’ve learned? It can be really helpful to summarize the analysis you did afterwards, both as a means of better understanding it yourself and also as a way to store it for future reference. One easy way is to create a Google Doc with the basic steps you went through and insert any graphs or visuals you made. This resource might be helpful for others to look at as well! This is a tool I use all the time for breaking down complex, uncertain topics into understandable pieces. When I’m faced with an important decision, or when I’m trying to determine some kind of strategy for the next six months, I’ll turn to a space analysis, breaking down the space of decisions that I could make. I hope this is useful for you as well—and if you have any suggestions for additional tools or ways of thinking that are helpful for you, please let me know! Here is a list of some of the spaces that you could analyze that might help your understanding of the animal rights movement. 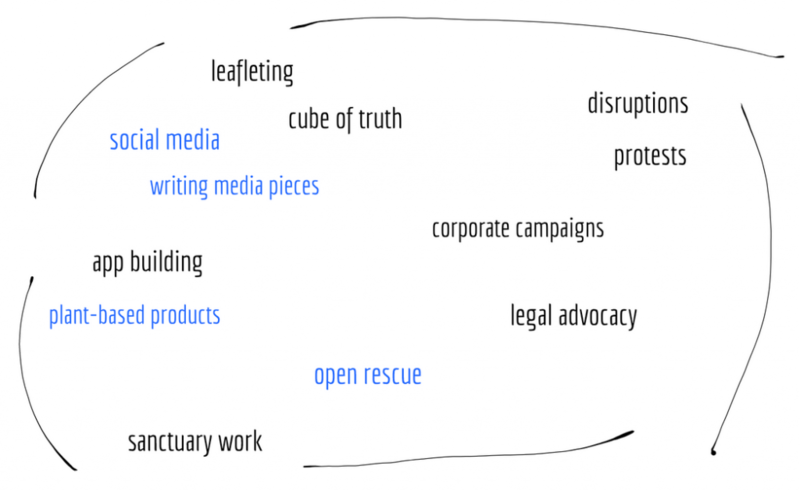 Some of these spaces are applicable to building grassroots activist communities; some of them are applicable to creating new vegan products; some of them are applicable to any kind of public-facing messaging you do. I only included things here that I think have a direct application to some aspect of the movement. There’s no limit to the kinds of spaces you can analyze. The main question is, how will understanding one of these spaces help you to help more animals? Professions and skill sets that we need more of in the movement. Personality traits of activists, non-activists, non-vegans. Types of animal advocacy groups. Parts of society that need to change in order to reach a vegan future. Parts of the animal rights movement. Categories of food items that we can create vegan versions of. Social/religious institutions, and their relationship to animal rights. Forces that indirectly prop up animal exploitation. Structures and types of communities. Types of popular media outlets. Ways people spend their free time. What people spend their disposable income on. Movement funding recipients (organizations or tactics). Types of other social movements. This list isn’t intended to be comprehensive, but more to spark your imagination and see what types of questions you could ask yourself during the process of conducting a space analysis. What are the main categories of this space? Is there a way to break up the space into categories and subcategories that help me understand things better? What are the main items inside each category? What are the less important items? What’s missing? Has my own perspective or bias prevented me from seeing whole areas of the space that I’m leaving out? 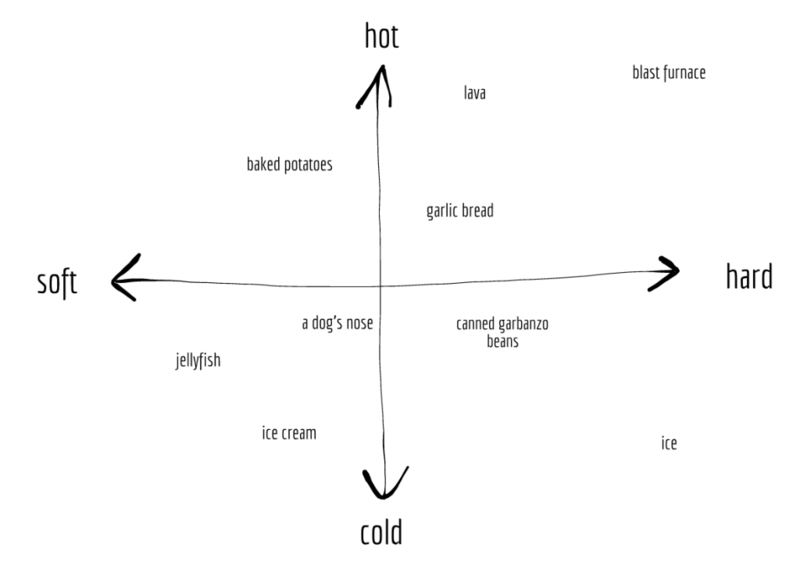 What kinds of quadrants could I create to help me get an understanding of the space? Am I analyzing the most important aspects of things? Are my axes and my “distance” the most relevant for what I’m trying to accomplish? Who else thinks about or works on this particular issue? Is there anything they do or know that’s missing here? Can I reach out to anyone to ask questions or talk more about this? As activists, we tend to want to solve things. Trying to do everything yourself ignores all that humans have learned that could help you out. Imagine Isaac Newton coming up with calculus without first learning any of the basics of algebra that others had developed. Imagine Ethan Brown trying to form the Beyond Burger without learning anything about cooking or business (both very deep fields with lots of preexisting knowledge), or Memphis Meats trying to create clean meat without hiring cell scientists. Imagine HappyCow trying to build its product without learning about the internet or how “rate and review” apps work. It’s a fairly simple idea, but it often gets forgotten during exactly the times when we should be using it. If you have a problem you’re trying to solve, or you have something you might want to build… See what’s out there that can help. Learn what’s already been discovered, and soak up as much knowledge as possible. No matter what you’re trying to do, there’s probably a good amount of knowledge already out there that can help you. Some of it is stored in books, or on the internet—but some of it might just be stored in the heads of others. Sometimes you need to ask people who are doing the things that you want to be doing. Before you embark on a five-month research quest for one of your projects, I want to clarify—I’m definitely not saying to “focus exclusively on learning and wait until you know absolutely everything before trying anything.” In fact, that approach is what I see a lot of people doing these days: spending forever in “learning” mode without ever actually trying their idea; and then, honestly, usually never getting to the “trying” phase. Do you know those people who are always talking about things, researching and reading and planning, but who never seem to actually make it to the doing phase? But, if you’ve found your way to AMP, you might be more of a natural doer. If you are, ask yourself if you’ve underdeveloped your “learning from others” skills recently. You can’t make progress by only learning. You also can’t make progress by trying things in a vacuum. Add your own new pieces and thoughts. What are currently working on? Have you looked for the work and knowledge that already exists, that others have built through the years? Are you integrating their learnings into your work so that you can have more of an impact? If not, can you start today? Quora. A good general purpose Q&A site. Quora seems like an especially good place for people who are currently doing something (like running a nonprofit) to give advice to folks who ask questions about wanting to do something. The Good Food Institute. Want to know something about plant-based or clean meat? This is a great starting point. Animal Charity Evaluators. A good place for information about animal advocacy organizations. Also good for learning a bit about the intersection of effective altruism and the animal movement. Plant Based News, LIVEKINDLY, and the Mercy For Animals Blog. Also, set up Google Alerts for things like “vegan”, “veganism”, “animal rights”, “clean meat”, etc. Your friends, your online vegan network, and any other people you can find online or that your current network can connect you to. When you boil everything in society down, you’ll find humans and their relationships at the core. If you want to learn about something, find someone to ask. If they don’t know, ask them if they know who would. Keep asking, and you’ll not only learn a ton, but you’ll build great relationships along the way. 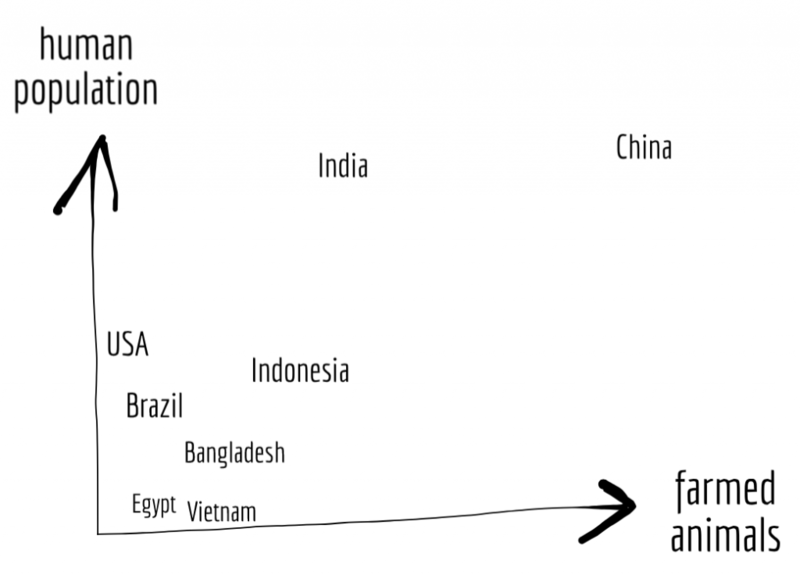 This is the second article we’ve posted about ideas for fostering innovation in the movement. You can read the first article here—Imagine: LA Vegan Meat Competition. If you wanted to be a catalyst for innovation in animal advocacy, how exactly would you do that? Vegan Outreach deciding to physically get information into the hands of millions of college students, and building the infrastructure to accomplish that. The founding of The Good Food Institute to support the growth of plant-based and clean meat products. Direct Action Everywhere taking the model of open rescue and growing it to include hundreds of participants. The Save Movement focusing on love-based activism and bearing witness to animal suffering right at slaughterhouses, filming and sharing footage globally via social media. Anonymous for the Voiceless taking factory farm footage into public spaces and engaging viewers in serious, Socratic dialogue about the issue of animal exploitation. The Humane League forming The Open Wing Alliance, a massive global coalition of organizations working to end the practice of keeping egg-laying hens in cages. Mercy For Animals putting vegan resources directly in front of millions of people globally through a huge online advertising program. Street activists creating viral activism videos centered around conversations with non-vegans, like the work done by Earthling Ed, James Aspey, and Joey Carbstrong. HappyCow creating a single app that people all around the world can use to find vegan food at restaurants. The point is that none of these things existed in our movement prior to someone deciding to take the initiative to either imagine the idea or import it from elsewhere. These ideas were brought to reality by people who had the immense drive, grit, and luck to make them happen. They’re often created by strong teams, reminiscent of the “start with who” lesson from the book Good to Great. But crucially, many of these ideas came to life without much support from the movement—they happened because the individuals cared deeply about the issue and were able to successfully rally resources on their own. If we’re being self-reflective, we might also see that our privilege (or lack thereof) is a big determining factor of whether or not we have the time and resources to successfully launch something new. I’m not saying that it was easy to create these things, not at all. I’m saying the opposite actually—that this process of creating something new is extremely difficult. It’s so difficult that the pool of people who can currently be successful at innovation within our movement is very small. But imagine—what would it look like if we made a conscious effort to help more people go from drawing board to launch pad? Here are a few ideas for how we might do that. Imagine a competition each year where people from all over the world make the case for new forms of advocating for animals—a new tactic, a new strategy, a new technology, etc. Let’s call it AR-x, where x stands for the new innovative idea. Maybe one person makes the case for plant-based food creation competitions. Someone else submits a proposal for using artificial intelligence to identify factory farms via satellite photos. A small group of people submit an idea for an app to help link people to activism opportunities. Each person in the competition has a very thorough vision mapped out. They explain the strategy, the benefits, the downsides, the costs, and the potential impact. They show the research, if there is any. They compare it to what’s currently being done or explain how it fills a hole. And, where possible, they show demonstrated success of actually putting the tactic to the test. They present the prototypes, the first iterations, and the experiments that they personally have done to test the viability of the idea. Then, the grading happens. How do all of the ideas compare to each other? Which of them are the most feasible? Which show the potential for the largest realistic impact? Which ideas fill holes in the movement? Which could get resources to be successful? A panel of leaders and investors within the movement debates and discusses, then finally comes to a conclusion—a small number of projects that they will fund prototypes for, and an even smaller number that will be taken on by organizations as experimental projects for a set period of time. Innovation competitions have helped solve a good number of challenging and neglected problems throughout history. Got a big problem that needs a lot of attention from a diverse group of thinkers and innovators? Start a competition. Some of the most famous recent examples come from XPRIZE, a foundation that incentivizes technological development in areas that could benefit humanity. The inaugural XPRIZE competition led to the first privately-owned spacecraft flying in orbit around the earth. 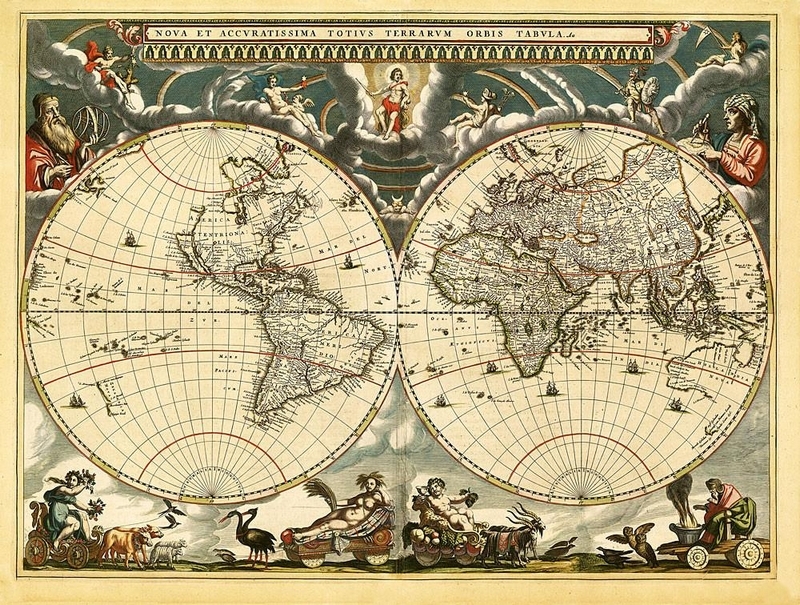 In the 1700s, the British government offered a prize to anyone who could devise a method for accurately determining longitude at sea, an issue that was causing sailors serious navigation problems. This competition resulted in many more people working on the problem, leading to an eventual solution. Advancements in artificial intelligence, new developments in nanotechnology, Charles Lindbergh’s historic transatlantic flight, advancements in mathematics, and potentially even the rise of potatoes as a food staple have all been facilitated or made possible through competitions and contests. What problems could we try to solve with competitions? One example is the creation of vegan foods or cell-based (“clean”, etc.) meat. What about a competition to create a viable business model for chicken farmers to switch to, like commercial mushroom farming in buildings that are currently chicken warehouses? An example of distributed innovation is the startup / acquisition model found especially in the tech industry. Large companies like Google and Facebook have a ton of resources at their disposal, such as one-of-a-kind datasets about information and people. But, although these companies constantly try to innovate and stay ahead of the curve, there’s simply too much going on all the time for them to explore everything they should. Enter startups—small, scrappy, bootstrapping groups of people who are passionate about solving a specific problem and who pour endless amounts of time and resources into solving the problem. Most of these startups fail for one reason or another: the problem doesn’t actually need to be solved; it’s too hard for our current technology; the co-founders can’t stand each other; funding is hard to come by; or some combination of those. But occasionally, a startup will succeed at making significant progress on a big problem, against all kinds of odds. The big companies like Google and Facebook see the successful startup and realize that it has created value by solving a specific problem. They come in and offer to buy the startup, or maybe the startup approaches the big company and pitches a sell. The big company gets the benefit of successful innovation without having to risk all the failed attempts. The startup gets the support and resources of the big company, which are often necessary to scale their product up to the level where they want it. Win-win. How could we take this approach with our movement? Is there a way for bigger groups to encourage distributed innovation by offering the possibility of an acquisition for the most successful? I’m not currently aware of any examples where this has happened, but I would love to hear about them. The first step here is letting people know what’s possible. Part of the reason innovation is so hard is because it requires trying new things and building on the rich knowledge base already acquired in a certain field and being at least somewhat proficient at the skills needed to run a company or organization—skills like marketing, hiring, accounting and whatnot. Innovators often get one piece of the puzzle correct—creating the new thing. But then to be successful, they need to take that new thing and develop it into a fully viable model. This is where the innovator may fail because of not having the required skills. For example, imagine someone who has an amazing recipe for a new vegan food product but isn’t business savvy. On their own, they might never do anything with their recipe. Paired with experienced business owners, they could potentially create a very successful international food company. Or let’s say you have a specific skill such as project management. You believe in the power of innovation, but you don’t particularly want to jump in and create some new initiative yourself. You could be an active participant in the innovation process by helping innovators develop the project management skills they need. They benefit, you feel good about helping, and more animals are impacted. Think about where you might fit into this picture. Maybe you’re an innovator, someone who can take an idea and build it from the ground up with your blood, sweat, and tears. You have time and energy to put into something uncertain, and you’re willing to stick with it until it’s successful. Or maybe you’re the professional with a skill that would be useful to innovators. You can help people learn what they don’t know and show them paths forward they might not think about. You can share your knowledge with those who are trying to build something new. Or perhaps you’re someone who wants to build one of these ideas for growing innovation in the movement. Maybe you can start an innovation competition, or maybe you could fund one. Maybe you can build a website to connect innovators to resources. There are boundless possibilities. No matter how you see yourself, keep an eye out for how you can connect with others. Find people on LinkedIn or Facebook. Ask your friends and colleagues for connections. Find other activists and ask them if they want to have a phone call. (Or go out for a drink, if you’re lucky enough to live close to each other.) Ask yourself: What do I need? How can I help? Because at its root, innovation is simply the process of bringing people, ideas, and resources together to build something greater than the sum of the parts. Innovation is discovering and connecting and building. So what are you building?